1953 - A very rare and highly desirable one sheet movie poster. The artwork for this vintage sci-fi is terrific. Although the movie reviews were quite bad it surprisingly has a strong following. Rarely does the original one sheet surface in the marketplace for this title. I am also not sure if these women really do live on the moon since Neil Armstrong did not encounter them during his 1969 trip there. This beauty has been professionally linen backed. 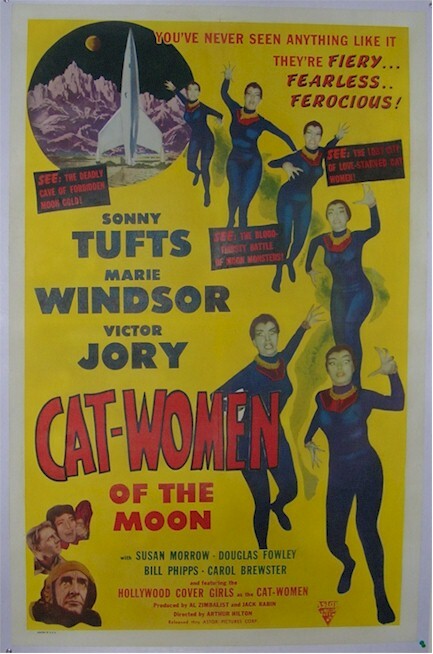 Cat Women of the Moon tells the tale of a group of American space travelers who confront a hostile tribe of females on the border between the light and dark side of the moon. The expedition is led by Laird Grainger (Sonny Tufts), whose polyglot crew--including co-pilot Kip Reissner (Victor Jory) and navigator Helen Salinger (Marie Windsor)--land on the lunar surface, where they soon discover that there's an atmosphere and water and everything.